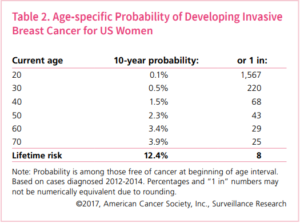 Currently, it is recommended that women ages 45 to 54 should get mammograms every year, and women ages 40 to 44 are given the choice to start receiving them if they wish to do so. Once a woman reaches age 55, she is told she should switch to getting one every 2 years, unless she chooses to continue with yearly screenings. Which is interesting, because the older we get, the greater our chances of the diagnosis. 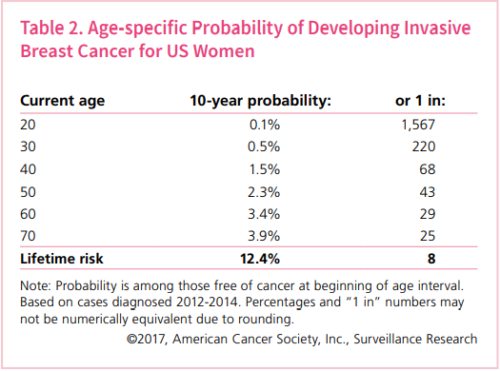 If you look at the chart above, created by the American Cancer Society, the chances of developing invasive breast cancer increases greatly between the ages 20 and 30. The rate increases over time. Wouldn’t it be nice for women to have tools they can utilize at any point in their life, that does not involve radiation and compression, yet give us a good indication of the health of our breasts? Breast thermography is a painless, radiation-free risk assessment tool that may help discover potential issues in our tissues. Thermograms, performed with an infrared camera, record temperature changes on the skin’s surface, and show us these patterns as a heat map. Breast tissue that is significantly warmer may indicate infection, trauma or inflammation. In addition to inflammation, an increase in the formation of blood vessels in breast tissue is often associated with the presence of a problem. Since these areas are shown on thermograms, it can give us a picture of areas we need to pay attention to. It can detect vascular changes in breast tissue associated with breast cancer many years in advance of other methods of screening. Physiological changes can occur years before structural changes are present. It can take five to ten years of development before a lump appears on a mammogram. With regular Breast Thermograms, women can better monitor the health of their breast, as they will be alerted of any physiological changes in time to incorporate preventive strategies to reduce their risk of developing disease. Thermograms are non-invasive, and do not require any personal contact with the one performing the imaging. Because they involve zero radiation, they are safe for all women, even when pregnant or breastfeeding! Because they do not involve compression, they’re also a great tool for women who have had breast augmentation. Thermograms at The North Raleigh Well Nest are performed by Gaye Walden of Holistic Breast Health, and follow the protocol dictated by American Academy of Thermology. Images are evaluated by a doctor, and you are presented with a detailed Report & Risk Assessment prepared by the doctor. In addition to the screening tool, we suggest women also learn how to do a comprehensive self-exam of their breast tissue at least once a week, so you can become familiar with your tissue that occur with the hormonal changes throughout the month. Its is also important to learn how to perform massage on yourself, to improve or maintain the health of your breasts. Linda Zukowski of Metamorphic Massage for Women has studied with one of the few educators in the country on this topic and is able to teach women what they can do to take the health of their breasts in their own hands. Please note: Thermography is not a standalone test for breast cancer, and it does not give you a diagnosis of cancer. The US Food and Drug Administration (FDA) views thermography as an adjunctive tool. It is used in conjunction with other types of screenings to give you a clearer picture of the health of your breasts. Our services are not intended to diagnose or treat any disease, and we make no claims as such. Next PostNext What is Spiritual Love?